Serrano High School football coach Ray Maholchic hopes his team won’t be at too much of a disadvantage next week. Just more than a week away from their Aug. 26 season opener at home against Lancaster Paraclete, the team will miss five days of practice this week because of the Blue Cut Fire. With the fire escalating quickly Tuesday, practice was cancelled that day and school has been cancelled for the rest of the week. Maholchic, who is also the school’s athletic director, said the Snowline Joint Unified School District’s policy is no practices can be held if school is cancelled for reasons such as a wildfire. Serrano had been set to scrimmage at Redlands on Friday with the freshman team scheduled to host Redlands Thursday in a scrimmage. Serrano will now go without the scrimmage and Redlands will join a scrimmage at Grand Terrace that includes Grand Terrace, Chino and Riverside Norte Vista. “Usually, we have a scrimmage where we can correct some things, but we’ll go right into game week,” Maholchic said. Maholchic, who was evacuated from his home in Wrightwood, where many of his players also live, expects to be back at school and practicing as usual on Monday. He also expects to be able to play next week’s game at home. First, I hope that as many homes as possible can be saved from this brutal fire, and not just those who are with Serrano football. That being said, you have to wonder how well the football players are doing emotionally, even if their families and homes are safe. I hope it doesn’t have too much of a negative impact on them as they prepare for their Week 0 game. In addition, I hope there won’t be any issues with playing the game at Serrano. A 63-0 win and a perfect record are gone after Serrano High’s football team agreed to forfeit one game. Serrano had routed each of its first four opponents, including a 63-0 win over Palmdale Quartz Hill on Sept. 11. Ray Maholchic, Serrano’s athletic director and football coach said a player entered the fourth quarter of the Quartz Hill game who had originally had his transfer cleared. But after the game, additional review of the transfer by the Snowline Joint Unified School District determined that the student should have been required to take serve a 30-day sit-out period. As a result. Serrano will forfeit the game. Serrano, is now 3-1, ranked No. 5 in The Sun Top 10 and No. 2 in the CIF-SS Eastern Division poll. The Diamondbacks have a bye this week before traveling to play Norco Oct. 2. Maholchic said the player is expected to play on the junior varsity this season. Many of the top San Bernardino cross country teams will be to the Woodbridge Invitational at Orange County Great Park. Unlike most invitationals, Woodbridge is run in the late afternoon and evening, featuring the girls rated and girls sweepstakes races at 8:54 and 9:34 p.m. and the boys rated and boys sweepstakes races at 9:14 and 9:54 p.m.
Chino Hills, Serrano and Yucaipa are in the boys rated race while Ayala, Bloomington, Colony and Rancho Cucamonga are in the boys sweepstakes. Girls rated teams include Chino Hills, Colony, and Rancho Cucamonga, while girls sweepstakes teams include Ayala and Serrano. 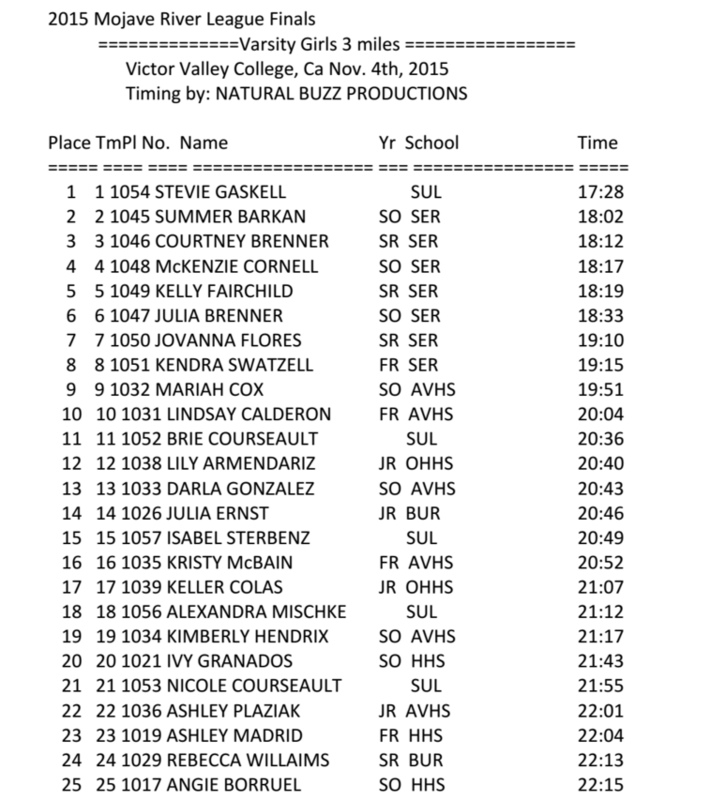 The Serrano girls are currently ranked second in CIF-SS Division 2, but will not have a chance to compete against No. 1 Saugus in the meet. However, a good showing, including facing CIF-SS Division 1 No. 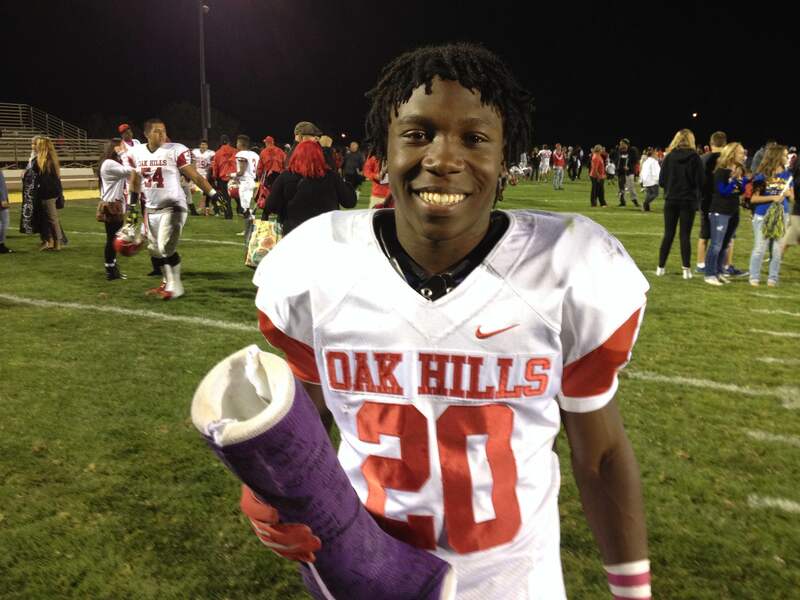 1 Temecula Great Oak, could move the Diamondbacks up to No. 1. 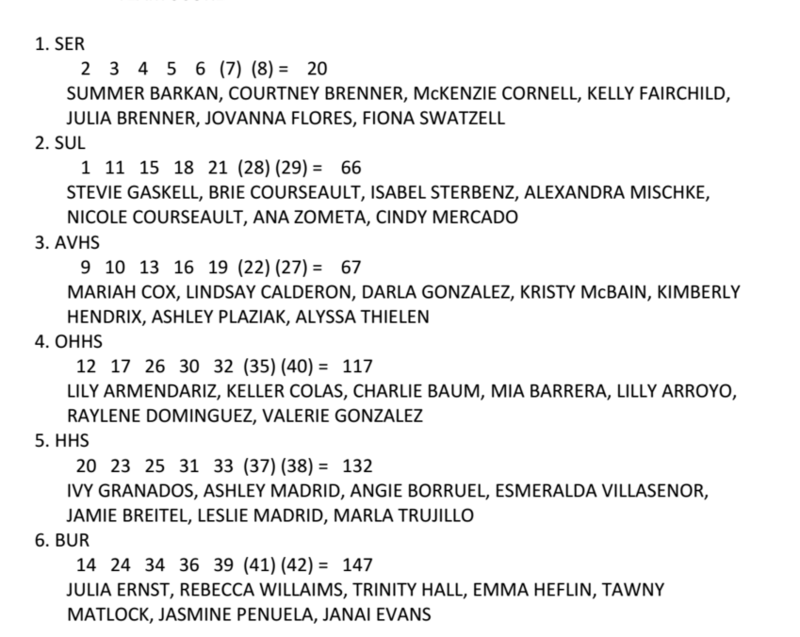 The county will also be represented by three girls running as individuals in the sweepstakes race: Sultana’s Stefani Gaskell, Citrus Valley’s Claire Graves and Summit’s Jennifer Sandoval. If you’re in San Bernardino County and a cross country fan, you know the Serrano girls cross country team has annually been one of the best teams in the county. Now, others in the country are learning that. Coach Ken Quinn said New Balance contacted him recently and told thim that with the Serrano girls one of the top teams in the country (currently ranked No. 2 in the state in Division 2), they are going to be sponsored by New Balance. That means a bunch of new gear, including Serrano-designed uniforms. Quinn said the Woodbridge Invitational on Sept. 19, is supposed to be the meet where they debut the New Balance stuff. That’s because Woodbridge is one of the top early-season meets in the CIF-Southern Section. Hopefully, we’ll get pictures of the uniforms to post here before Woodbridge. If you believe CalHiSports.com, (and I tend to believe them), the winner of Friday’s CIF-SS Inland Division championship game, Redlands East Valley or Riverside Poly, will advance to the CIF State Playoffs. Right now, CalHiSports has REV No. 1 and Poly No. 2 in Division II South rankings. The top two teams will play next week in the Division II South Finals, with the winner of that going to the state finals. Each CIF-SS Division is linked to a state division, and the Inland Division is linked with Division II. Teams must win a CIF title to advance to state, so both REV and Poly won’t be able to go. More of the rankings: No. 3. Bakersfield Ridgeview (11-1), No. 4 San Clemente (12-1), No. 5 Crescenta Valley (13-0), No. 6 Menifee Heritage (12-1), No. 7 Serrano (12-1). So, if you believe the rankings, the only way Serrano makes it is if Serrano wins and Ridgeview, San Clemente, and Crescenta Valley all lose. Heritage’s season is already over and ineligible for state. State playoff announcement comes on Sunday afternoon. So what school or school district has gone the longest without a title or an appearance in a championship football games? Redlands East Valley is the first Redlands district school in the finals since Redlands lost a 55-0 contest to Edison in the 1979 Big Five Conference. Colony last appeared in the finals in 2007, the second straight year it did so. Winning the Central Division title would make it the seventh time in the last nine years (since CIF-SS went from numbers to names on division) that a San Bernardino County school won the Central Division. Since 2007, a Chaffey Joint High School District school has won in 2008 (Rancho Cucamonga) and finished second in 2009 (Los Osos). Chaffey won the inaugural CIF championship in 1913, a 19-0 win against Santa Ana. Upland won in 2009, Colton in 2010 and Kaiser in 2012. Serrano’s last title was 10 years ago against Palm Springs, the same school they’ll face Friday. That was also the last CIF-SS football title for the San Bernardino County portion of the High Desert. The Diamondbacks are 1-4 in title games, the last loss five years ago against Palm Springs. Arrowhead Christian Academy won titles in 1996-97 and last played in the championship game in 2001, a 43-16 win over Mammoth in Division XIII. There’s just no escaping the history of their football program when Serrano High School players walk into the Bennett Fieldhouse that serves as home away from home. “I’m kind of a history buff,” said Diamondbacks head coach Ray Maholchic, who decorated the unique building with photos and clippings of past seasons. In fact, to enter his office, players must walk under a photo of the winning touchdown in the 2004 title game against Palm Springs. Interestingly enough, Serrano will host Palm Springs Friday night at 7:30 for the Eastern Division title. It will mark the third time in 10 years the teams will vie for the title, with each having one game. Serrano also played Citrus Hill in the finals in 2012. John Mackesy is a link to previous championship games. As a sophomore, he started both ways against Citrus Hill in 2012 and was a sideline witness in 2009 when older brother Anthony competed against Palm Springs. It’s been two years since the loss to Citrus Hill, yet it remains fresh in Mackesy’s mind. “It was very frustrating and sad. 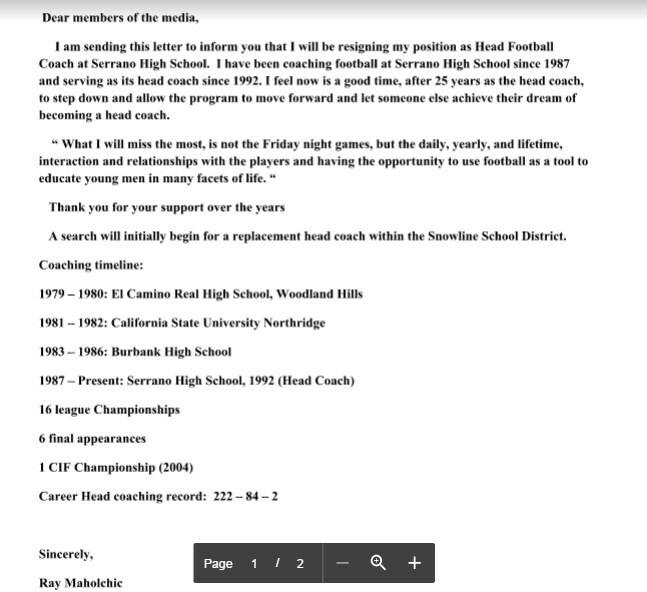 You work so hard for something,” Mackesy said at the CIF Championship Luncheon earlier in the week. “When you lose it’s a terrible feeling, but we just have to keep working. Younger brother Kevin is a Serrano sophomore this year and there’s talk 11-year-old Brian may be the best of Tony’s kids, who started the tradition while growing up in Redlands. Maholchic leaves no doubt where John Mackesy stands. “He’s like a coach on the field, he’s very mature,” said Maholchic of his 6-foot, 200-pound center/linebacker. “He thinks like the coaches; he has a lot of football sense. That’s an impressive statement considering Maholchic has been at the school for 23 seasons.